Looking at this Fun-Filled City, London is a beautiful place to behold, very popular for tourists, incredibly beautiful in giving it's visitors attractive sights. Exploring London is a great fun, one that if you haven't experienced, life's fun is never complete. From the modern Coca-Cola London Eye, to the historic Tower of London, Even better many London landmarks are free to visit, while others are available with your Cash in Hand. But let's talk of this, Unusual and Fun things to do in any London sightseeing trip. Some are weird but they are fun. 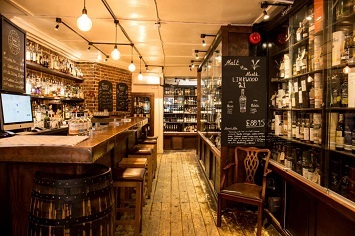 One of the unusual things to do in London, is visiting the Milroy's which is the London's oldest whiskey shop; it comes as no surprise that Milroy's has an incredible selection on hand. In fact, they even have liquor locks so you can stash your bottle for next time. This is somehow weird but it's fun-filled when you get drunk at a beautiful place like this with friends taking pictures of you in your drunken state. With more bottles of whiskey in front of you drinking recklessly at the Milroy's, it's one of the best fun-filled activities you could ever do in London. Want to do some Scary Fun-Filled activity? 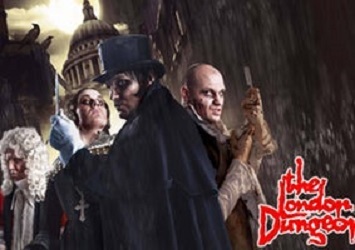 How about you bang into the ancient Capital's most horrible history at the London Dungeon to experience live actors, thrilling rides and exciting special effects? Embarking on a Journey through a dramatic London Landscape, travel back to Jack the ripper's bleak White chapel and walk beneath London's foreboding medieval gates. But it takes the brave to experience this fun, you just have to ask yourself some rhetorical questions before going there "Am I brave enough to face this? ", Or "Am I brave enough to enjoy the fun in spinning around in the darkness, ducking, diving, dodging and shooting my way out?" If all these questions can be given a positive Yes answer, then prepare yourself to enjoy the most fun filled event in your stay in London. One of the Unusual fun-filled activity many people don’t do in London is this whereas, If you Visit London without having this experience, your London trip should be Fifty Percent Rated. 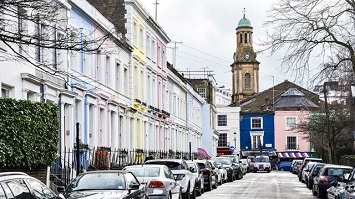 Notting Hill is an affluent area best known for its colourful houses and Pinterest-worthy doors. You can spend hours here, zig zagging up streets, sipping teas, licking ice cream as you gaze astonishingly at the most visually appealing neighborhoods in London. From the LASLETT HOTEL - 8, Pembridge Gardens. London W2 4DU. To the PORTOBELLO ROAD never forgetting these major addresses; 54, Portobello Rd and 14, PortBello Rd, London W11. Then sliding right to the CHEPSTOW VILLAS - 58, Chepstow Villas, London W11, 2QX. And don't forget to walk up 18, Denbigh Terrace, London W11 2QJ. 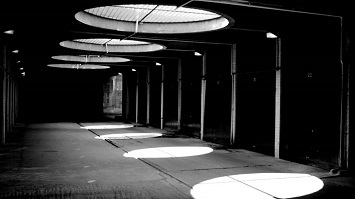 Here comes the best fun-filled activity involving taking of beauty photos at a car park, the Beauty of this Car Park are the beautiful pods of light shining down from the skylights and obviously making it a must-to-go location in London. Models, Hot Music Stars, Good Looking Gals and Guys love to take their good looking pictures at this beautiful car park because taking pics at this place is a fun-characterized event. Pictures at this place are highly recommended for a perfect profile pics or picture taking lovers and the greatest luck of highest fun is if you are lucky to meet one of your favourite stars also there to take pictures thereby, making you feature in their lovely pics. 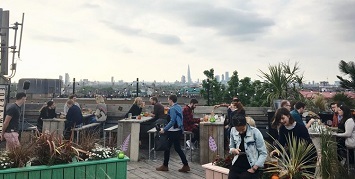 This unusual activity to do in London is to visit The award winning Rooftop Bar which is one the Bold Tendencies Gallery, from it's beautiful piss-stained stair to the top of the elegant Multi-Story. Sitting at the rooftop Bar gives you fabulous views of the city. Apart from its outstanding Architectural structure, the bar will also provide you with Restaurant-Quality foods, proper table services, expect Mediterranean-influenced small plates and lots more. 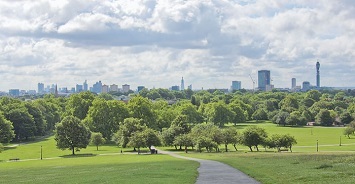 Early Morning views are always fun-filled, Primrose Hill standing 215 feet (65m) provides the perfect location to view the sun as it rises over London, located on a ritzy Northwest London Neighborhood, it is the perfect place to be early in the morning to enjoy the daybreak while night lights still glow in the pack itself. You can say your early morning prayers there, sip your early morning hot tea and obviously take a couple of photos. To crown it all, it would be of a great fun to take some pics under an oak tree known as Shakespeare's Tree standing on the slope of the hill planted in 1864 to mark the 300th anniversary of Shakespeare's birth. Sunday's Afternoon after church service must be fun-filled, and so this gorgeous indoor garden is the best place to have a remarkable free sightseeing afternoon Tour. 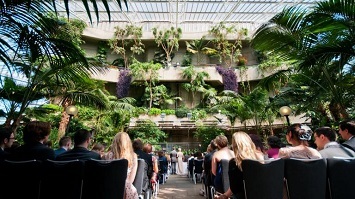 The Barbican's Tropical Conservatory is open on Sundays' so, taking one's spouse, relative and friends for an afternoon tea there makes more sense and much fun. The excitement, the fun, the sights are all embedded in this Second Biggest conservatory in London and the Jungle is massive which means, you can also walk round this conserved Jungle. Yes, it's all fun-filled in here as you catch glowing moments with the Chinese without visiting China, Spending your day here is what you won't forget during your lifetime. 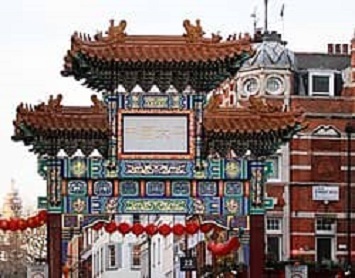 Chinatown is an ethnic enclave in the city of Westminster, London bordering Soho to it's North and west. It contains vast numbers of Chinese restaurants, bakeries, supermarkets, shops and other Chinese-run businesses. Taking a walk through the street, exploring the authentic restaurants, join in some special events to enjoy the fun in the flavour of Chinese culture in London. You can try checking out some of their foods using their wonderful chopsticks; it would be fun getting to know how to use the chopsticks. You can also flood your gallery with awesome and exciting moments by taking photos with the Chinese. One of the unusual activities to do in London is walking up and down a staircase which might sound uninteresting enough but I assure you that the Staircase at Renaissance Hotel will make you run like a kid up and down a staircase. Plan a moment in your schedule to visit the Renaissance Hotel, the excitement and structure of the cyclic clockwise staircase is enough to make your visit/stay in London awesome. 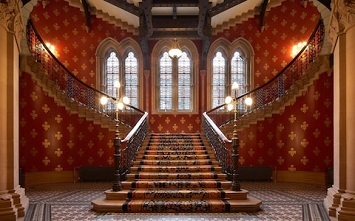 This double staircase as designed by George Gilbert Scott was made extra wide, and because of it's structure and design, it is the world's most Instagrammable Hotel Staircase. Taking a posture on the stairs, standing elegantly with your beautiful outfit on the stairs and taking different types of positions, all to fload your gallery with lovely Pics will make your journey to London memorable and fun-filled. Address:Enston Road, London, England NW1 2AR, U.K. This is an unusual activity to do in London; the journey to London would be incomplete if one forgets to visit the largest Public gallery in the National History Museum. The Hintze Hall was described as a "Cathedral of Nature" when the Museum opened in 1881. It would be much fun if one is able to sit, and feel the ground of this beautiful hall, using one's hands to feel the wall of this gorgeous hall. 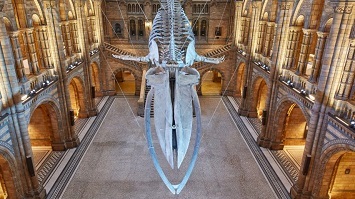 One specific and noticeable thing that you shouldn't forget to explore very well is the Skeleton of a Blue Whale named "Hope" would be seen handing at the centre of the Hall. The beauty and light of this blue whale complemented the gorgeousness of this Hall. It would be an offence on your spirit if you fail to visit this museum. In short, Hintze Hall boasts a dramatic sense of place, with it's grand entrance leading to soaring Romanesque arches, magnificent stone staircase and large capacities. Isn’t it fun-filled to visit the Cathedral of Nature? Don't get bored when you visit London, want to try being gluttonous I think Borough Market is the best for you. It is the best to visit in BOROUGH Market on an empty stomach, so there would be room for storing samples of bread, cured meats, cheese, olives and pastries in your stomach. Being London's best and most famous food Market, it gets extremely and chaotically busy, but don’t let that want you down because even with that it makes a lot of fun. You may choose to arrive early if you have to do some shopping and most especially to grab a coffee from Monmouth on the south side of the market to create a perfect kick off for your day. 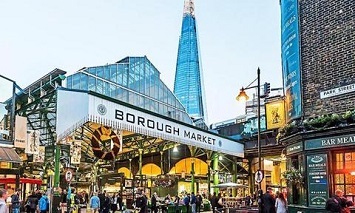 Have a fun-filled day ahead in London as you do some market stuff in Borough Market, London. Fearless Admirers, going to the Shard in London will add more fun to your visit in the city. The Shard is London's one and only 95- Storey skyscraper and the tallest building in Western Europe. The handful of years old building is an ace place from which one can view London in all it's glory. Don't forget to fearlessly get to the very top of the building where bars and restaurants are. The 602,779 square feet building equivalent to the Area of almost eight Wembley Football pitches beautifies the skyscraping world of London when viewed from the inside of an Aeroplane/Helicopter. Have fun viewing London in her Glory!! Duration:10am to 10pm (access until 8:30pm), Sun-Wed: 10am to 7pm (access until 5:30pm), Closed on 25 Dec. If you are looking for some free but fun- filled activity to do in London, a walk/pass through the Light-Up Tunnel is enough. To get the best of it, an evening walk through the tunnel would be complemented with the exciting shifting colours and the patterns they form are just enough to make your day in your visit to London. It is one of Europe’s longest light-walls and was created by The Light Lab and Spiders Major. The tunnel has a gentle curve and the walls are lined with repeating panels, backlit with LEDs, along the full length so there are no shadows. And you can also have fun waiting for the right pattern as a background to your pics, and if luck be on your side, you can meet celebrities who are there to take some pics and thereby making you have fun as you feature in their lovely pics. First Friday in London is filled with fun activities, Are you one of the Lucky people that would be spending the First Friday of a month in London? We think you should be congratulated. The best and perfect place to be is the Clowns Gallery Museum in London. Clowns have an unofficial rule that no two performers are allowed to have the same make-up. In order to ensure that clowns were not duplicating each other’s look, a practice of painting each unique design into an egg began. 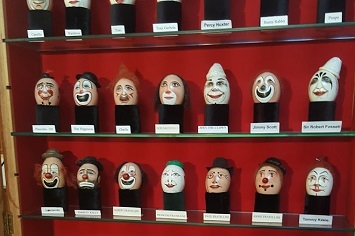 The museum has a collection of more than 200 of these eggs; it also has photographs, pops and other galleries of these Clowns including pics of their live performances. Lots of fun checking out the paintings and also visual appealing photographs and pops of Clowns, going there is just equivalent to getting your ribs ready to be cracked. One of the unusual activities to do in London is having a creek low tide walk and Deptford Creek is the best place to do that. Deptford is only three miles from London Bridge so it's a busy London Suburb. In Deptford also lies a Bridge called Deptford Bridge which was built of stone in 1628 across the River Ravensbourn. Now talking a guided walk at low tide around the creek is embedded with fun and excitement because the creek is a haven for freshwater and saltwater plants and animals including birds, butterflies and some 120 species of wild flowers. Walk last around two hours and booking is essential.